Lots of new faces (well, in the form of Masks) could be found in the 1983 Collegeville Catalog, while the company was still selling various knock offs such as the Spider (a very healthy run since I wore that same suit in the mid seventies) there was also a staggering amount of licensed goods available. From dependable favourites such as the "Peanuts" to newbies like "Shirt Tales" and "Joanie Loves Chachi" and eventually hitting rock bottom with down right bizarre items like Atari Games and Rubik's Cube, Collegeville had managed to cover a great deal of bases. 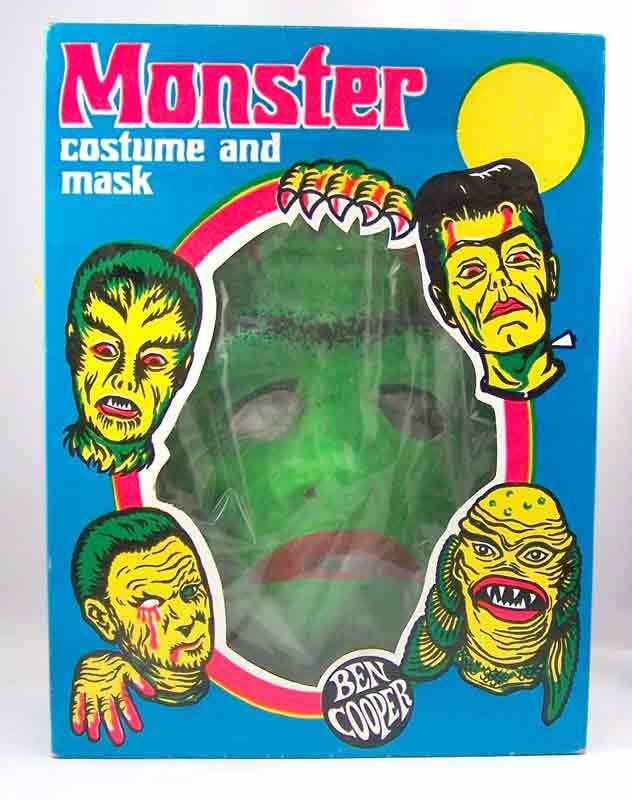 Perhaps the biggest get here is the Universal Monsters line, an array of both childrens costumes and rubber masks which bring back a pile of fond memories for me. 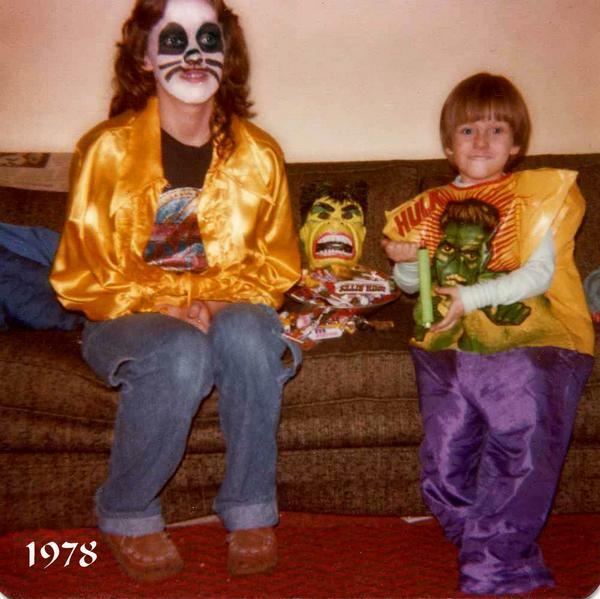 As an added bonus, I've compiled all the retro Halloween shots I got into one big gallery on the site, check it out here or click the image. 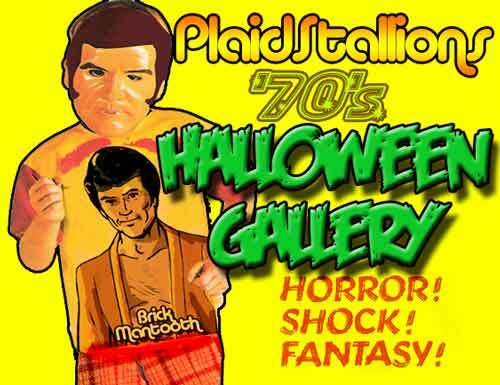 With October 31st a day away, it's prime time to launch another Top Ten List, this time it's (in my humble opinion of course) the top ten coolest Monster Toys of the 1970s. 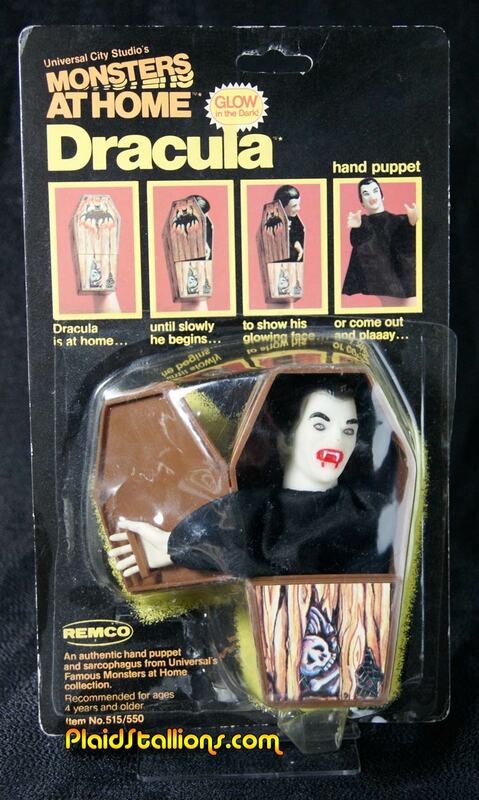 Being undead seems to be a big boon in the toy world. 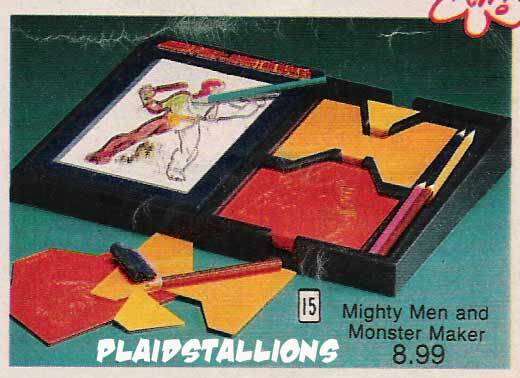 Even though the seventies were a far cry from the Monster merchandising boom of the mid sixties (which really was a golden age except for the lack of action figures), it wasn't exactly a drought either. 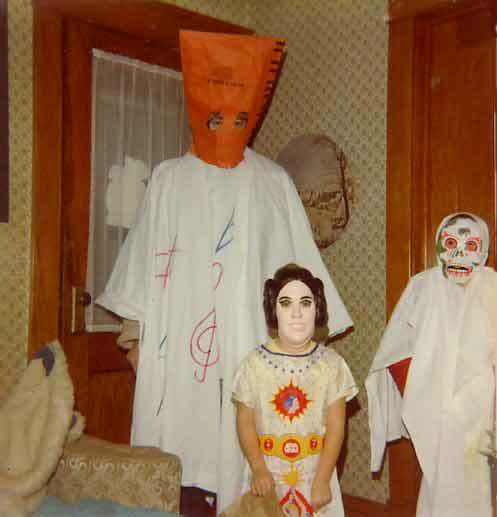 Although before my time, I kind of dig these early seventies play suits which I'm sure doubled as Halloween costumes. 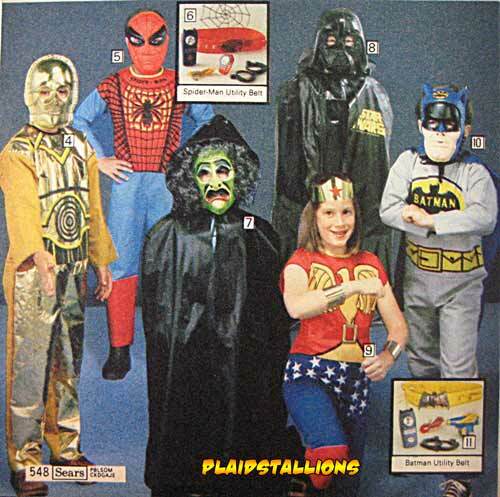 I love how boys can be Batman, Superman and the Lone Ranger but the girl's choices are more grounded in reality. Dig the ears on the bat suit, looks like the 40's movie serial version. 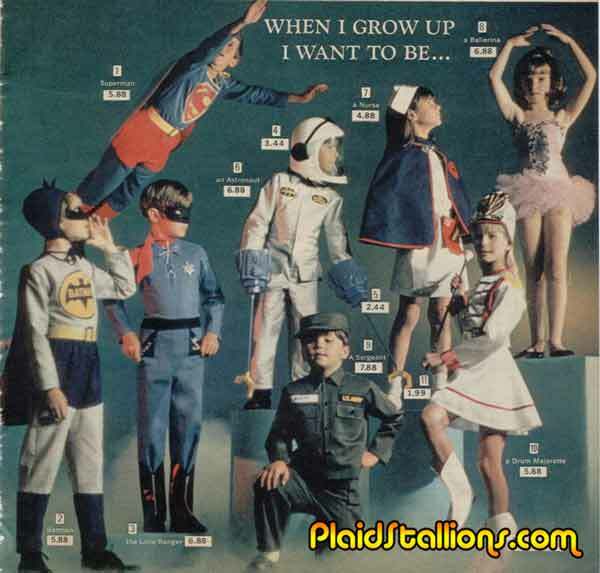 This flash forward to 1978 shows that girls can be superheroes too. 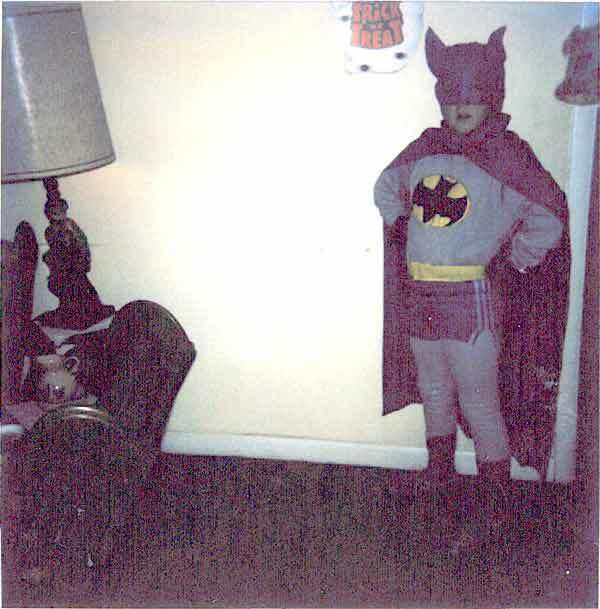 Nobody in the 70s seems to have gotten even a semi accurate Batman costume. They always seem to have to oversell the name, like without it you'd think it was an insurance salesmen costume. 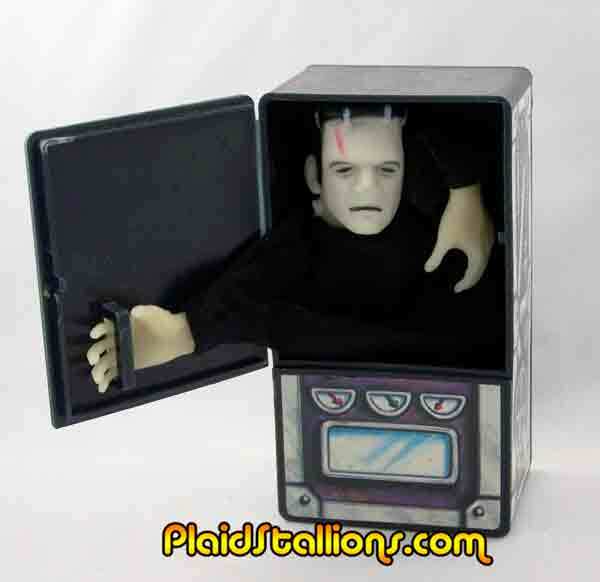 Proof this site is bad for me department: I've never had any ambitions to collect vintage Halloween Costumes but this Sunday found me at a toyshow with $20 in my pocket and the neat-o graphics on this Ben Cooper Frankenstein outfit were overpowering. Is it just me or this another example of swiping from the Aurora artwork? It's refreshing to see this many monster toys on a Christmas catalog page, usually they get kind of dismissed or marginalized as being "seasonal". The only thing missing is some slime. While I've blogged about Gre-Gory being the one that got away for me as a kid and my obsession with the Remco Monsters is well documented, my favourite piece in this spread would have to be the Tomy Mighty Men and Monster Maker. I got this set for my tenth birthday and it was one of those things that was just as fun as it was on the commercials. I knew a couple of girls that asked for it for Christmas after seeing mine but they all got fashion plates instead. My own wife got Fashion Plates but said it was fun because she mixed the monster plates from her brother's set making weird-o she creatures. 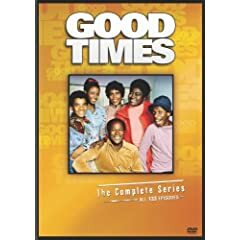 Plenty of classic 70s goodness this week, mostly of the television kind, kicking it off with the complete series set of Good Times. 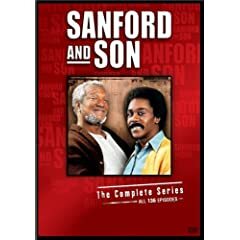 Also released today is the complete series set of Sanford and Son. Now this is a show I know that holds up because I watch it every chance I get and it still makes me laugh. This 17 disc set has 136 episodes of the classic series, I had no idea the series lasted that long to be honest. 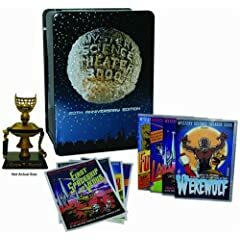 Finally and this is where my money is going this week is the 20th Anniversary set of Mystery Science Theatre 3000 . 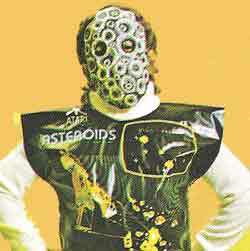 I can't say enough good things about MST 3k, I love it more than a grown man should. Christmas in the 70's Update : Santa Terror! 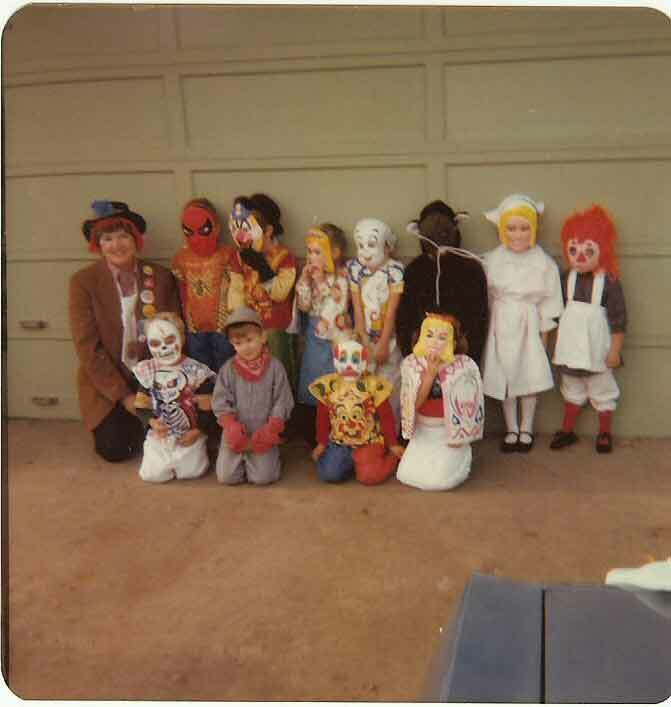 I know it's Halloween week and all but I wanted to mention that there is a new entry on the Christmas in the '70s Book Blog. This week Betsy shares a very memorable encounter with a mall Santa. Please read "The Flood" here. If you'd like to share a memorable photo -- and a story -- of you in your Christmas-morn best (or worst), please email Joal and Myself at: xmasinthe70s [at] yahoo.com. 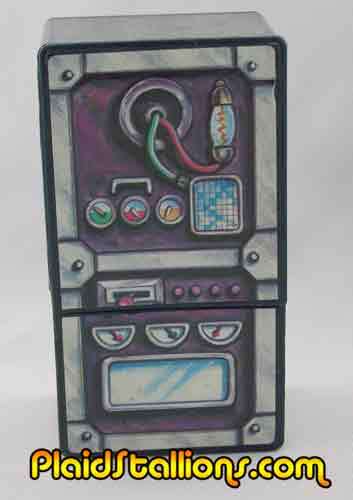 With Halloween appraoching, it seemed like a great time to showcase all the little additions I have for the various Rack Toy pages on the site. It's all about the Monsters this week. 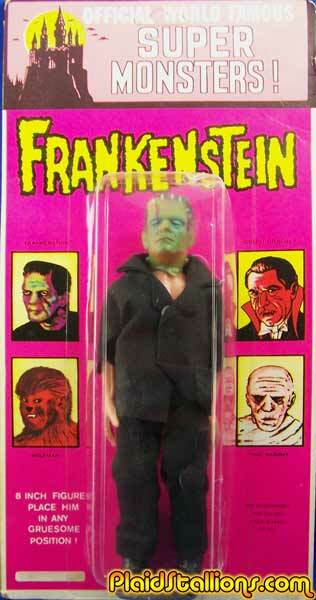 Above is a carded Azrak Hamway Frankenstein, later issue than the one previously featured on the site, the card now includes Dracula (and sadly, deep sixes the Creature). The doll no longer has a green body or a shirt. As crude as this is, I am really smitten with this one it looks like a guy wearing a Frankenstein Halloween mask. 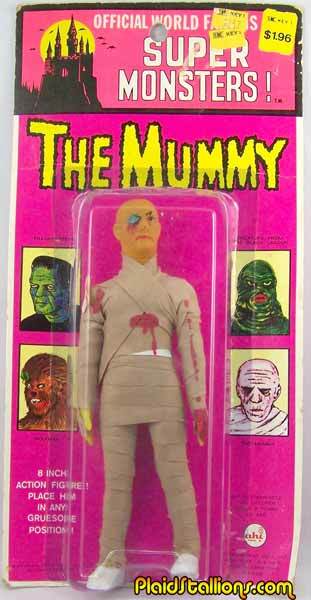 This is an early version of the Mummy, he's kind of got a skirt going on with those bandages. Dig the blood all over him, he's been a busy boy. This is an AHI jointed wrist Frankenstein, showing off his ability. He needs a jacket to be complete. 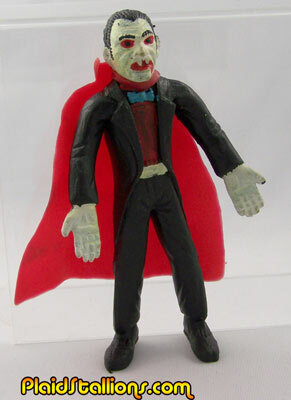 I'm normally not a big Dracula guy but I totally love this Bendy by AHI. Bendy figures are a weakness of mine and this guy also kind of resembles the Dracula puppet in "Forgetting Sarah Marshall". 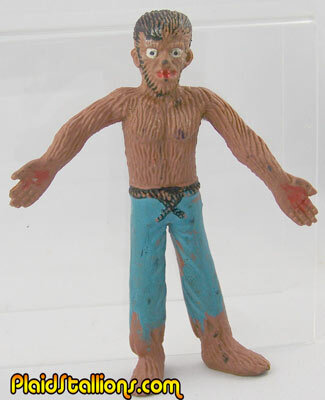 Another Bendy from AHI, this time it's the Wolfman, a favorite character of mine. These things are not only adorable but totally addictive. 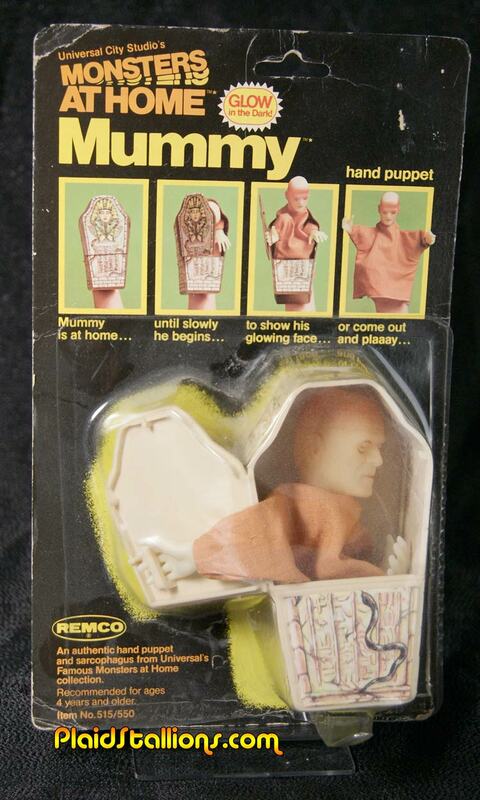 If anybody has the Mummy or the Creature for sale, drop me a line. This young lady was apparently marketed as a "victim" to go along with the Lincoln Monsters by a catalog company. One of my sources believes it was the Harriet Carter Catalog, anybody remember or possibly have a scan? Finally, we have a variant of the Lincoln Phantom of the Opera, I am really fond of this one because it's the same version I had as a kid. 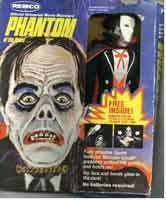 The other version has ripped sleeves and lacks the ruffles, the Phantom was a better dresser in my eyes. 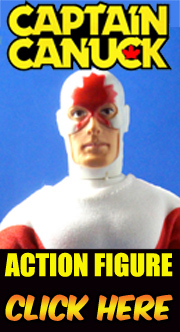 I'm also pretty positive this is the same figure I owned but stupidly sold in the eighties, the battered card it came on looks awfully familiar. Kicking it off today is my pal Lee wearing a Ben Cooper Hulk suit, nobody loves the Hulk more than Lee. 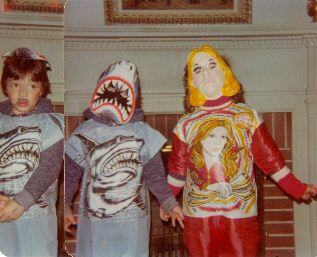 Speaking of big fans, here is Lou in a Collegeville Jaws costume, Lou is still actively involved in Jaws Fandom, check out this youtube link. 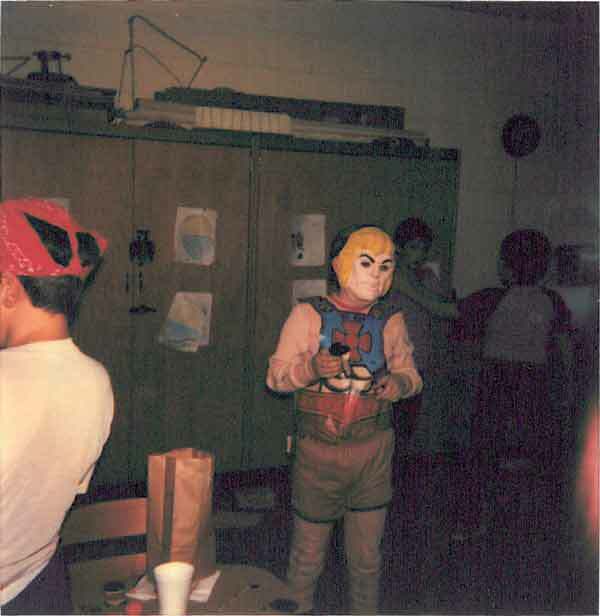 From Gotham City to Eternia, here's Chris as He-Man a few years later. 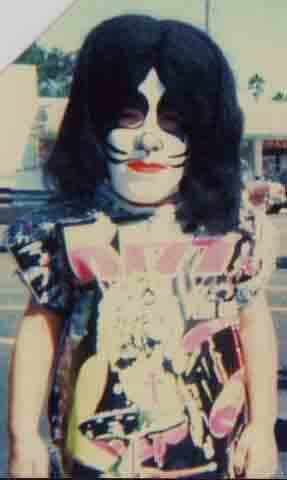 Casey sent in this cool Peter Criss Kiss Costume, say that three times fast. 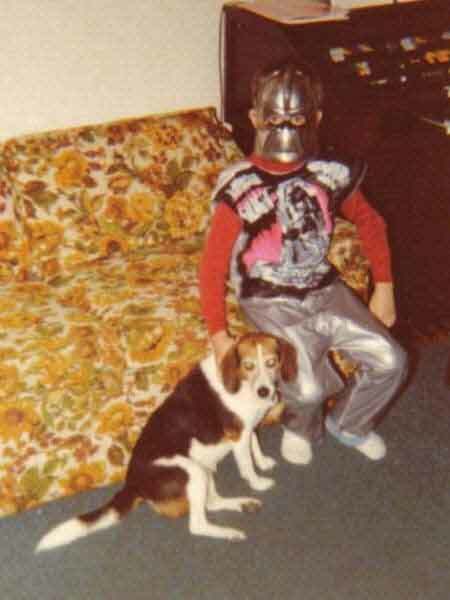 Time to unveil more of the fabulous vintage photos you kind folks have sent me this month, above is Wes Booth as a Cylon long before they were called "Toasters". 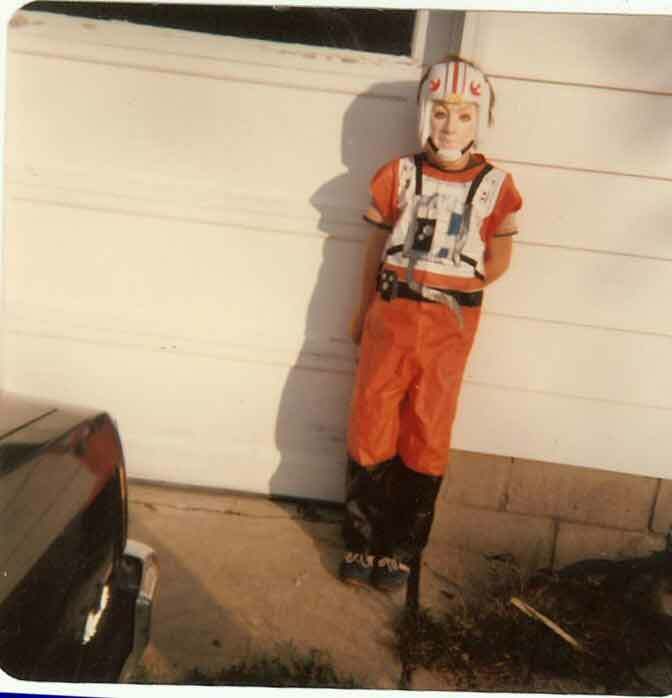 Kolin sent in this trippy shot of himself as an X wing Pilot, that's a great costume. And here is Kolin's class from an earlier year, love that Ben Cooper Spider-Man. In 1981, Remco, a division of Azrak Hamway International for almost the past decade, went through some changes in their product line. Demand for many of the items that had been staples for the company such as Utility belts and powerzed Superheroes was starting to wane. All the Hulk merchandise and the Star Trek CSF sets of previous years were now gone. 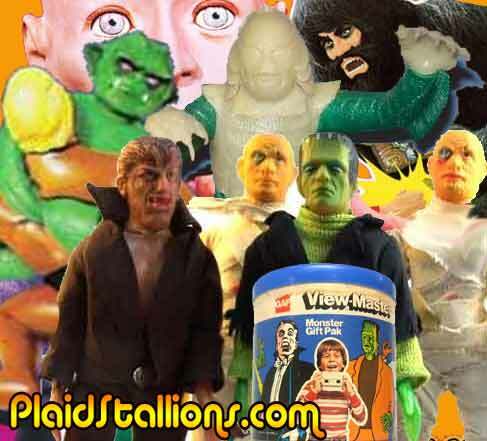 Instead, Remco began to expand with things like Crayon cosmetics for girls and by expanding upon their Universal Monster license with a new series of mini monsters and two new additions to the 9" series in the form of the Creature and the Phantom. 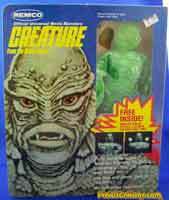 As an added bonus click on the Monster pages to see a full gallery of packaged figures and playsets. While Monster Toys often get the shaft in department store catalogs for being too seasonal , the one place where that doesn't seem to happen is the games section which always have a few monster items in for good measure. 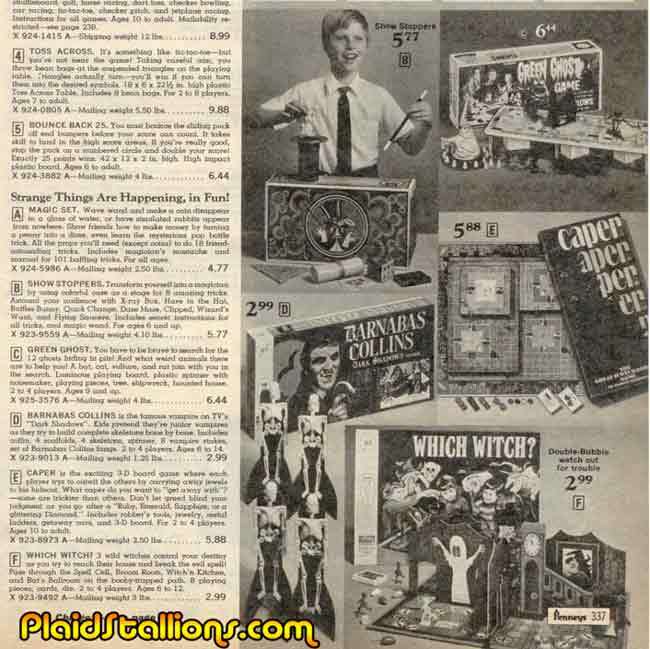 Take this 1971 spread for instance, we've got the classic Green Ghost game , something called "Which Witch" and a TV boardgame from the popular daytime horror show Dark Shadows. 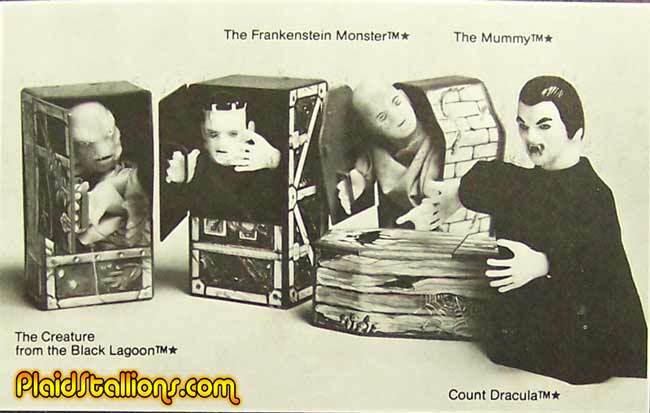 The Remco Monsters at Home series is a weird little footnote in Monster toy lore, basically the company took the heads and hands of their 9" Universal Monster dolls and made these charming little hand puppets complete with a plastic environment. What's weird is, it all sort of makes sense, Dracula has a coffin, the Mummy a tomb, the Creature a sea chest and Frankenstein..... OK they don't all work but there is something likable about this line. Mummy Mint On Card, he looks pretty sleepy. The Front of Frankenstein's "home"
I'm missing the Creature if anybody has a picture they'd like to contribute, drop me a line. 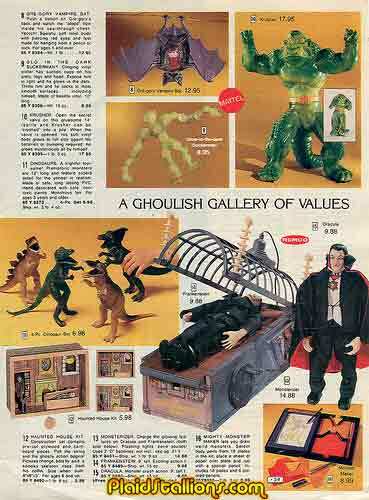 In 1975, Kenner produced a doll that was the brain child of special effects artist/director/writer Alan Ormsby who directed the film "Children Shouldn't Play with Dead Things" and authored the classic scolastic book Movie Monsters which probably spawned a legion of Monster kids by itself. 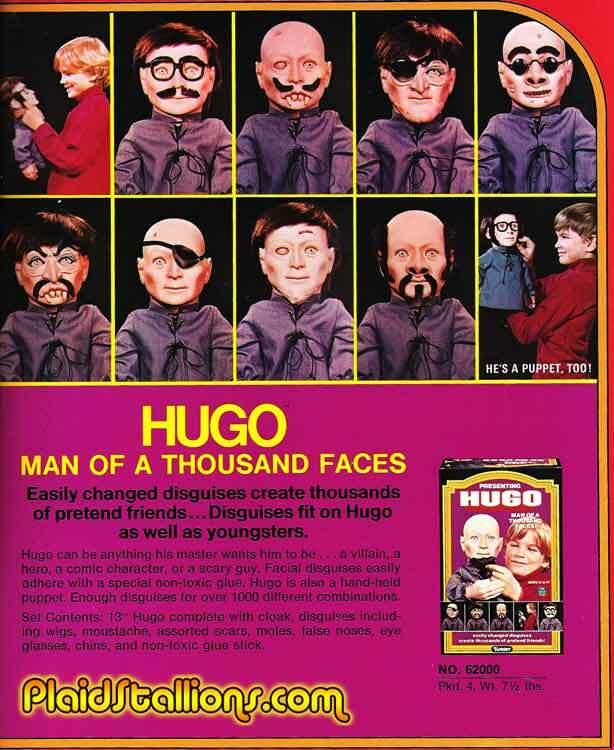 Hugo was a great concept, a puppet version of Lon Chaney sr, complete with makeup kit so you could give him hundreds of combinations of creepy disguises. As a bonus (?) 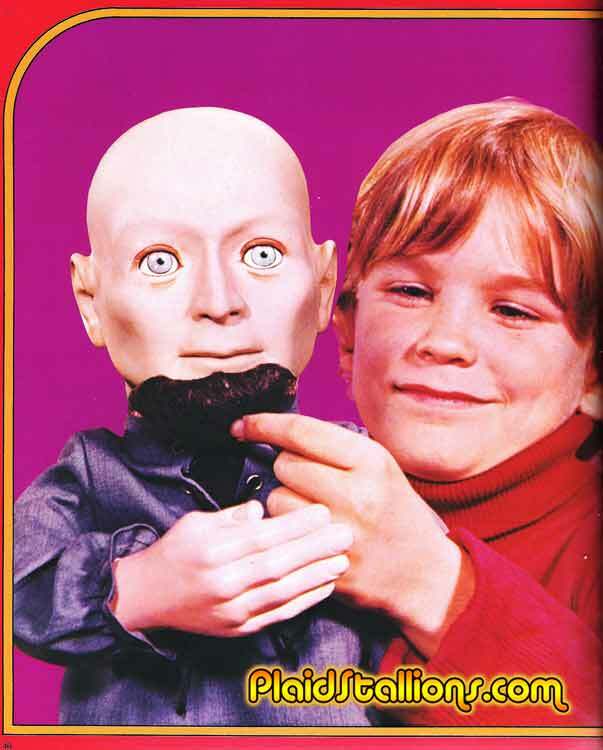 the Hugo puppet on it's own was creepier than ten ventriloquist dummies, his unusual stare had him featured in Pee Wee Herman's original act and on the popular "Uncle Floyd Show". 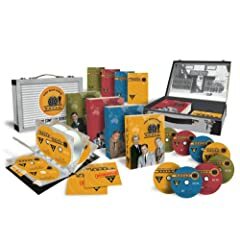 Two big TV classics are out today, first is the complete box set to the Man from U.N.C.L.E series. It took me a long time but I eventually grew to love this wild sixties spy series that started a national craze. The series goes from straight to breezy to downright campy and all of it is enjoyable. Lots of stars in this series as well from Yvonne Craig (a boyhood crush I never recovered from) to Sonny and Cher, even James Doohan as a baddie. The other big release is one of the most seminal series of the 1970's in the release of the complete box set to the Incredible Hulk series. This long running classic show sent a nation into "Hulk Mania" and just by running through some of the toy archives on the site, you can see how big an impact this series had. I recently rewatched the pilot movie and it still holds up, eventually the show's formula tends to grind but it's still a classic. Nuh nuh nuh nuh nuh THE BAT?